It finally dawned on us why our dining hall doesn’t serve pastries like they do in the patisseries of Paris. If it did, we would likely fail our classes just to stay back another year to indulge in the desserts. There must be a correlation between deliciousness of cafeteria food and graduation rate. But don’t get us wrong – the Ratty does make mean Rice Krispies treats, and their bananas aren’t too shabby either. If you want to impress the special someone you happen to be sharing the dining table with, then this dessert is the perfect way to express your love. Even if you’re not in the cafeteria, you can easily make this in your kitchen, and serve it with homemade vanilla frozen yogurt, or other frozen treats. The key to success is in the prudent selection of the ideal banana. The sweet chewy stickiness of Rice Krispies treats calls for a slightly under-ripe banana to complement it, and of course everything is better with vanilla soft serve! Connie and Annie are sisters and bloggers making the most of dining hall fare at the Ratty, Brown University’s dining hall. They blog at Ratty Gourmet. Slice the Rice Krispies treats in half to form thin layers. Slice the banana into 1/4 inch thick medallions. 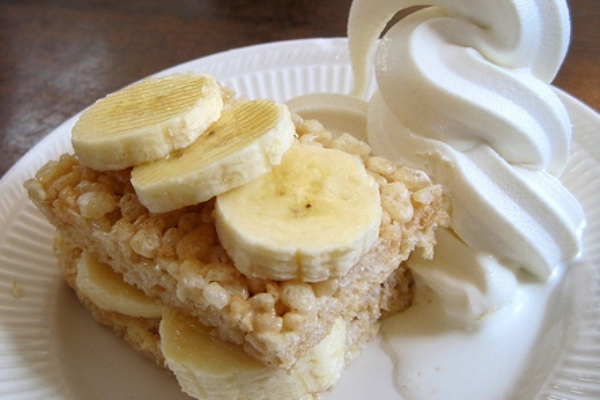 Layer the banana slices between the Rice Krispies and place some slices on top. Attempt to coax the vanilla soft serve into a tame swirl next to the banana-Krispies tower and enjoy.